I argue that the physiological, phenomenal and conceptual constitute a trichotomous hierarchy of emergent categories. I claim that each category employs a distinctive type of interactive mechanism that facilitates a meaningful kind of environmental discourse. I advocate, therefore, that each have a causal relation with the environment but that their specific class of mechanism qualifies distinctively the meaningfulness of that interaction and subsequent responses. Consequently, I argue that the causal chain of physical interaction feeds distinctive value-laden constructions that are ontologically distinct for each category. Within the limitations of the interactive mechanisms of each category, increasingly sophisticated forms tend to evolve. The increase in sophistication in each category inevitably leads to the emergence of the novel mechanism particular to the next in the hierarchy. In essence, there is an emergent hierarchy of evolving categories delineated by the nature of their mechanism of environmental engagement. I argue that biochemical mechanisms have a tendency to evolve meaningfully, specifically in a way that is both qualitatively relevant and responsive to environmental particulars. I explain that these mechanisms set in play an organisational imperative that leads to the emergence of the capacity to evaluate and prioritise qualitative biochemical assimilations which, inevitably, generates a subjectively individuated experience phenomenon. I then relate this to the novel characteristics of the human perspective. A correction to this article is available online at https://doi.org/10.1007/s12304-019-09355-x. If on a clear day I were to ask you, “Where is the Sun?”, you might point to it and explain that your brain perceives by way of a complex of neurological and biochemical mechanisms. Notwithstanding illusions or hallucination, you are justified to state categorically that you believe it to be true that the Sun is located where you are pointing. But there are many species of plant whose leaves and/or flowers indicate the Sun’s location by following its movement in virtue of their biochemistry too. Evidently, this action of plants is one that bears a correspondence with our own. While philosophers tend to baulk at the idea that plants possess knowledge, semioticians appear to have a broader outlook. Notably, Vehkavaara (1998) argues for an extended and more naturalist concept of knowledge that covers both the traditional and more realistic definitions, one where the standard definition must be included as a special case (pp. 207–209). Others include Emmeche (1999) who states, “semiosis is the transformation of energy into signs … occurring within particular orders of matter-energy configurations. These orders are systems of knowledge” (p. 92), while Ferreira (2011, p. 7) talks of “innate knowledge” that embodies vital environmental information which is formed from “biological predecessors,” and Kull (2009) who states, “Once the correspondences of organisms to the world are not eternal but a result of (ontogenetic or phylogenetic) experience, the adaptations turn out to be a kind of knowledge, a model that is acquired or worked out via certain mechanisms” (p. 81). Perhaps these variations of interpretation indicate that we need more expansive concepts that facilitate the explication of the meaningful informational relationship between all living organisms and their environment. 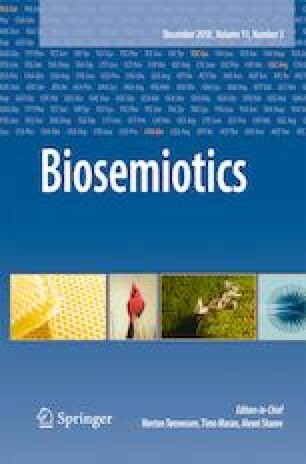 In many respects out of necessity, this paper confronts this problem of terminology in exploring biological meaning: I argue that there are distinct categories of knowledge and that the acquisition of knowledge requires, in each case, a unique kind of discourse actualised by a particular class of interactive mechanism. However, the overarching narrative is concerned with a much broader challenge, namely, the subjective–objective divide. Nagel (1986) provides seminal treatment of this challenge. He suggests, “that the concept of the self is open to objective ‘completion’ provided something can be found which straddles the subjective–objective gap” (p. 51). He surmises that this will probably take centuries. I consider this pessimistic, for the key to providing the bridge, in my view, resides in biosemiotics (a view shared by Hoffmeyer 1999, p. 151) because subjectivity, at base, is all about meaning, in its relational sense, between the subject (broadly interpreted) and its world. As will become evident, this papers will reflect the view that biosemiotics can qualify “a formal ontology for emergence and the behavior of complex systems in general” (Stjernfelt 2007, p. 33). Stjernfelt argues that to achieve this requires “mediate concepts” for philosophy to integrate, on the one hand, a mechanist physics which explains things only in causal terms, and on the other, what he calls “judging bodies” within the physical world. He explains, “the very teleological orientation of judging makes it possible for judgments to find judgment-like processes in nature” (p. 203) (see also Vehkavaara 1998 who expresses the view that a loose analogy between justification and adaptation can be drawn, p. 209). Needless to say, given its broad scope, the paper will at times be guilty of giving short shrift to some areas that call for extended treatment. But, if we do indeed have centuries, what’s the hurry? As I will indicate later, ontological emergence is central and links the three-part division of the paper. In Part I, I defend two claims in respect to the correspondence between physiologies in general and the environment in which they have evolved. The first is that the evolution of an accurate correspondence between physiologies and their environment requires some kind of meaningful interactive engagement between the two. I call this engagement a meaningful discourse; the second, is that physiologies constitute an informationally pertinent construction that is responsive to environmental particulars in a manner that is qualitatively relevant. In Part II, I explore the significance of qualitatively relevant biochemical mechanisms in providing the foundations to the emergence and evolution of organisms that possess phenomenal consciousness. In Part III, I relate these ideas to the emergence of an evolving awareness of the embedded subjective self and existential world-view. Concerning the aforementioned correspondence between plant and human, we begin by examining the meaningful correspondence that exists between the environment and organism physiology. Consider the following. Imagine that two hundred years from now, humans have found on a planet in another solar system the dead fragments of a once living organism. The planet has suffered a global catastrophe and there are no living life-forms. On examination, it is found that the organism’s chromosomes are constructed not from DNA but an alternative compound. This is an errant alien DNA (eDNA) which, as such, informs the name given to the organism: Edna (cf. Emmeche et al. 1997, who, in discussing ontological emergence, talk of PNA rather than DNA in a hypothetical alien world). The geneticists of this future age have a complete understanding of gene–environment interaction. They do not assign causal privilege to genes in individual development but recognise condition-dependent gene expression, reciprocal causation and developmental plasticity (noting Laland et al. 2015). Using the eDNA, they apply advanced technologies that enable them to determine the developmental cycle of Edna and the possible environmental triggers of its developmental phases. They are able to reconstruct a plausible three-dimensional illustration of her and determine all of her interrelated biochemistry. This indicates how she created energy for respiration, how she reproduced, her reliance on insects for pollination and on hairy animals for seed dispersal, and so on. Importantly, the reconstructions of such things as her structure, colour, size and biochemical mechanisms enable them to make inferences concerning the nature of the environmental conditions in which she evolved. This reveals that she had a leggy structure, confirming the planet’s gravity as half that of Earth; her leaves had a high density of chloroplasts photosynthesising light in the green spectrum, indicating that light reaching the surface was very weak; thick hair and pliable branches suggest arid and windy conditions. The scientists themselves succeed in acquiring significant knowledge from Edna’s eDNA both about her species and, importantly, about the environment in which the species evolved. This knowledge is not compiled from disparate disciplines; the scientists do not collate their knowledge, for example, from geologists, climatologists, archaeologists, chemists, biologists and so on. Rather, their knowledge is compiled from only one coded source, namely Edna’s eDNA. Could it be the case that the human geneticists derive all their conceptually constructed knowledge about Edna’s environment solely from the study and interpretation—interpretation being analogous to translation—of Edna’s physiologically constructed knowledge (alternatively, Vehkavaara 1998 uses the term “environmental knowledge”, p. 212) which was accurately and responsively informed by the environment in which her species replicated and evolved? Edna is a product of her replicating lineage. If one could somehow film a lineage over a million-year period using time-lapse photography—entertaining the notion that a lineage might be, in some imaginative way, a physical body (admitting of it no true objectification: see, for example, Gregg 1950; Deely 1969; Wilson 1999 regarding the concept of species)—a one-minute film would give the impression of a dynamic living reactive entity changing its form over time in response to the environment (cf. Ghiselin 1974 who describes species as individuals). In terms of organism–environment interaction, we might note that while a mechanical cause may initiate a complex response in any given individual from the lineage, that meaningful response is mediated by its physiology which is a product of the generational engagement of its lineage with the environment. As Vehkavaara (1998) rightly emphasises, “in the level of genetic adaptation, it is not the individual organism that is gathering knowledge, but it is the lineage” (p. 213, italics added). Clearly, there is a meaningful engagement between replicating lineages and the environment that is coded for, and it is this that is then “played out” in the physiology of its individuals (noting similar discussion in Ferreira 2011). Wiener (1961, p. 169) speaks of ontogenetic and phylogenetic learning.1By using the term “phylogenetic learning,” Wiener promotes the thesis that environmental knowledge is acquired through adaptation: typically, when we say that learning takes place, do we not also say that knowledge is acquired? Vehkavaara (1998) reflects this view stating that “[a]daptation through natural selection can be seen as a kind of learning process, as an evolutionary learning, where lineages, populations, or species (but not individual organisms) are considered as individuals that are learning about the conditions of the survival of their ‘members’ …” (p. 209). And so the Edna case seems to indicate that the human geneticists’ conceptual knowledge is reliant on Edna’s physiologically coded knowledge in respect to the environmental landscape, courtesy of phylogenetic learning—notwithstanding the scientists’ a priori knowledge in being able “to read” and interpret this code. As such, I propose that physiologically constructed knowledge is a distinct category very much separate from the category of knowledge we might associate with human reasoning. One may well be inclined to counter that I am merely talking here about adaptation by another name. In one sense I am talking about the mechanics of adaptation and survival, but importantly, I am talking about it in terms of the meaningful engagement and correspondence between species and environment. In the next section, in exploring the nature of the meaningful engagement and correspondence, I intend to argue that the acquisition of physiological knowledge is due to a particular kind of discourse. In “The Theory of Meaning” (1982), Uexküll emphasises that “life can only be understood when one has acknowledged the importance of meaning” (p. 26). Indeed, Barbieri (2008, p. 2) states that one of the main challenges of biosemiotics is the attempt to naturalise biological meaning. In my view, meaning cannot be acquired without some kind of mechanism of discourse, where a mechanism of discourse is one that is capable of assigning value to what would otherwise be bland causal mechanics. In much the same way that I seek to extend the concept of knowledge, I propose extending the concept of discourse to account for how a lineage fosters a meaningful correspondence with its environment. Of course, some might reject offhand the proposal that there can be discourse between species and environment stating that discourse is the preserve of humans: species do not talk. They may cite Foucault (1972) or Matthews (2005) who defines discourse as “any coherent succession of sentences, spoken or written” (p. 100). Alternatively, I suggest that discourse describes any process whereby an interactive mechanism generates meaning—where “meaning” is not some arbitrarily assigned status but is a status that is somehow justified for being of worth or value.2 Later, this definition will be contextualised, but for now we address whether a replicating lineage’s dynamic relationship with the environment counts as a kind of discourse. Discourse is typically regarded as a two-way process; is the lineage–environment engagement really a two-way process? The work of Sánchez-García et al. (2017) clearly speaks in these terms when discussing the concept of the “eco-field network” (from Farina and Belgrano 2004) in relation to bark beetles (see Laland et al. 2015 who explore the nature of the interdependence of gene expression and environment when advocating the extended evolutionary synthesis framework. See also Laland et al. 2011 who challenge the dominant view regarding “cause and effect in biology”). Sánchez-García et al. explain that in ecosystem ecology, new conceptualisations concerning niche construction, reciprocal causation and habitat have emerged in an attempt to account for the nature of the interactions between species, organism and environment, which, importantly, include the interconnection of both biotic and abiotic components (Barker and Odling-Smee 2014; Matthews et al. 2014). A key concept is that the activities of organisms modify environmental conditions, which in turn affect the evolutionary parameters of the species and others (see also Lewontin 1983 and Odling-Smee et al. 1996 who detail the concept of generational “niche construction” activities). Intuitively, their point makes sense: that the more complex an environmental niche, the more dynamic might be the interrelationship between the biotic and abiotic actors that constitute the eco-field network. In terms of a discourse, a replicant’s individual organisms ask, “Do my particular physiological traits sufficiently mitigate survival pressures within this dynamic eco-field?”. If the individual survives and replicates, the answer is a functional and meaningful “yes”. In turn, the individual’s and its replicants’ survival, impacts the extended environmental eco-field thereby realizing a complex lineage–environment feedback that reflects on the network and the lineage over an extended generational timespan (see Vehkavaara 1998, p. 213 who describes the community and the environment as “giving shape to each other”). In this context, consider von Uexküll’s (1982, p. 56) description of the tick’s “living environment” and how, in more complex examples such as that of bark beetles, interactivity might become significantly augmented. In a similar vein, Ferreira (2011, p. 5 and in reference to Maturana 1978) talks of “the equilibrium inside the niche” and of the “plastic structures of both living system and its typical environment” as they shift in a “dialectic relationship” due to “mutual non-destructive perturbations”. Granted in the exchanges between lineage and environment, no words are enunciated and the nature of the question is non-specific (one might question whether it is limited to only phenotypic traits for example: see Sterelny 2001 on the differences between the American and British schools concerning the unit of selection, be it gene, organism or species), but the question is no less posed and, importantly, answered through the influence of survival pressures. So phylogenetic learning does appear to be qualified by a replicating lineage’s interactive generational discourse with its dynamic environment. Being generational, this “discourse” (or equivalent term that captures the essence of the evolving meaningful lineage–environment relationship) transcends the interactive responses of the individual subject because it spans generations. In other words—again noting Deely (1969)—the cause and effect principle, which qualifies our understanding of what physical interactions between individual physical states entail, is transcended by replication because replication institutes a novel and meaningful interactive dynamic which spans multiple interactive events over a generational timeline. One might argue that the process of a lineage’s generational discourse subverts classical causal mechanics, or, in Cassirer’s (1985, p. 148) view, subordinates the problem of causality to the general problem of signification, thereby accommodating O’Connor and Wong’s (2015) conclusion that if emergent properties are not to be epiphenomenal or explanatorily irrelevant, novel causal roles have to be introduced for emergent properties (see also Emmeche 1999 for a similar appeal). A lineage perpetuates a correspondence between its forms through successive generations, potentially in perpetuity. Consequently, interactive events do not simply have their immediate and concluding effect. Rather, the influence of classical mechanics gradually becomes subsumed over generations by the influences of physiology. So we can observe, to put it simplistically, that while a domino will fall the way it falls when prompted because of causal mechanics, an organism may well respond differently to being prodded by reacting in a distinctive or measured way that is informed and instructed by its particular physiology. This point highlights a bifold distinction which Merleau-Ponty (1963) explores in-depth. A mechanical action, whether the word is taken in a restricted or looser sense, is one in which the cause and the effect are decomposable into real elements which have a one-to-one correspondence (p. 160). This causation point is key in considering the concept of ontological emergence in relation to physical properties and their value to the individuals of a lineage—a point to which we will turn shortly. For now, we can restrict ourselves to acknowledging that the discourse between a replicating lineage and its environment ensures that from one generation to the next biochemical mechanisms that mitigate survival pressures, or that are merit-worthy in conferring a survival advantage, become, by chance of genetic variation, increasingly responsive to pertinent environmental particulars.3 This ensures the evolution of a unique category of meaningful correspondence between the physiologies of a replicating lineage and its environment. The justification for the existence of these physiologies, therefore, is predicated on their capacity to mitigate survival pressures. What this ensures, over many generations, is that certain environmental particulars that are relevant to survival become assimilated in meaningful ways by increasingly complex biochemical and biomechanical mechanisms (being mindful here of Fodor’s 1996 objections to Dennett’s naturalistic teleology, particularly pp. 247–256). Having considered both how the mechanism of replication facilitates a generational discourse by which a meaningful correspondence can evolve between a lineage and its environment and how this mechanism alters the causal character of interactive engagement, I will now explore the unique nature of that correspondence. Let us first consider straightforward examples of meaningful correspondence that have evolved due to lineage–environment interaction. For instance, a biochemical mechanism might instigate recoil or withdrawal in response to a particular adverse stimulant. Alternatively, a mechanism might motivate movement towards a favourable stimulant. In both cases, such actions would constitute a direct causal relation, from signal to behavioural response: there appears to be a direct correspondence between the stimulus and the value attributed to it, courtesy of the requisite biochemistry, which thereby informs the appropriateness of the response. Although simple characterisations of environmental particulars such as these service many creatures well, there is no real depth in this attribution of mere positive or negative valency. In reality though, for many organisms, the nature of biochemical assimilations of environmental particulars is far more nuanced than that. The question is, how and in what way might they be more nuanced? Reflecting on this, it is pertinent to consider a more complex example of the signal–response relation by asking how we might interpret the assimilation of environmental stimulants that bear an indirect correspondence with their value.4 For instance, the biochemical assimilation of electromagnetic frequencies obviously has the potential to benefit survival, but they are a secondary property of objects. They are a secondary property in that any given frequency may be indicative only of the possible presence of a certain object of potential value to survival. In other words, electromagnetic frequencies have no intrinsic value to an organism. Rather, it is the object of their association that determines whether a particular frequency might be pertinent to the identification of object value. Of course, there are many other environmental properties that bear only an indirect correspondence to potential value. These include chemical, temperature, pH or acoustic signatures (see Fodor 1996; Papineau 1997; Millikan 2004, chapter 6 for extended treatment concerning teleosemantics). In these cases of indirect correspondence, the evolution of a meaningful signal–response mechanism does not confer clear survival advantages. We can surmise, instead, that the meaningful characterisation of indirect attributes must be such that they can, in some way, facilitate the mediation of judgments of value. Perhaps, we should consider that biochemical mechanisms institute a subtle and layered matrix of environmental attributions that reflects the infinite subtleties of a living meaningful engagement with the sensed world. How might we understand the nature of this subtlety? My suggestion is that this inquiry can be explored through the notion of qualitative relevance. The Oxford English Dictionary defines “qualitative” as “pertaining to or concerned with quality, where quality relates to merit or value”. The idea is that biochemical assimilation must assign not a direct or static attribution of merit to environmental particulars, but rather a qualitative attribution whose merit can subsequently be qualified by the relevance that those attributions might (or might not) have on an individual’s changing needs and survival demands. This ensures that there is a flexible indirect correspondence between the assimilation of environmental particulars and their value. But what exactly is a “qualitative attribution”? Typically, in relation to phenomenal experience (noting that phenomenal experience is not exactly what I am talking about here, but will come to later) philosophers talk of the “ineffable” character and “feel” of its qualities: they tend to talk of phenomenal content using metaphor and nonspecific descriptive terms. If I attempt to talk of the quality of redness, for instance, I might say it is vibrant, lively and warm; red coloration seems to catch the eye, and so on. Similarly, it is worth considering that any given organism with the requisite biochemistry would assimilate innumerable environmental particulars and, if we happened to have privileged access, those attributions too would all be subject to our description in nonspecific terms—the suggestion being that biochemical mechanisms that instantiate such qualities would, most likely, delimit to vague metaphorical description only. If we consider the infinite range of possible stimulants—from every colour, hue and shade, to every scent sensation and sound frequency, sound cluster and dynamic, and so on—we might hypothesise that they all have the potential to service a role in a structured matrix of qualitatively relevant attributions of varying and subtle description. Each descriptive characterisation might align in some nonspecific way to a range of stances that an organism might seek to adopt with elements in its environment. These stances would reflect the character of an individual’s affective inclinations, where inclinations would be qualified by an individual’s physiology as it relates to, such things as, the conservation or expenditure of energy, the demands in securing a mate, the requirement in locating particular nutrients, the desire to avoid particular hazards, the need to find conditions of preferential habitation, and so on. The idea that innate biochemical and neurological mechanisms have evolved increasingly complex weighted affective characterisations has some neuroscientific basis (Panksepp 2005; Izard 2007). Barrett et al. (2007) integrate the idea of primal innate valency with the “conceptual act model”. The suggestion is that all emotional events, at their core, are based in a psychologically primitive kind of affective response to events in the world. This, the researchers suggest, involves categorising environmental signs by rendering them meaningful. While what I am proposing is consistent with this, I am arguing more broadly about that primitive rendition itself, namely, that replication ultimately facilitates the emergence and ongoing evolution—courtesy of a generational discourse—of a meaningful correspondence that qualifies a unique qualitative ontology: physiological function inevitably imposes assignations of qualitative relevance on innumerable environmental particulars that are subject to qualitative descriptive only. In the next section, I will qualify what is meant here by a “unique qualitative ontology”, which, as a first step, is consistent with Emmeche (1999) who argues that a semiotics of biological systems requires a pluralist ontology of emergent levels of organisation. What I advocate is that replication creates an entirely new ontological status. Before replication existed on Earth such things as temperature, electromagnetic frequencies, and auditory signatures had no “qualities”. These physical properties bore only substantive physical and chemical relations to one another (relations that are explicated by the sciences of physics and chemistry). While some of these kinds of physicochemical relationships can be deemed “emergent”—for instance, concerning the stratification of different levels or orders of substance—I will not be advancing such notions of emergence here. Alternatively, what I am proposing is that there is a novel emergent ontology in the qualitative ascription to the physical, where the qualities of any given physical property are entirely dependent on the evolved physiology of individuals of a replicating lineage—qualities that would otherwise not exist in the universe. In this regard, I am saying that qualitative ascription, and not life, is the emergent (in contrast, Alexander 1920, pp. 46–47 speaks of life as a new emergent order of existence). This of course is consistent with Uexküll’s stance which opposes the view that environmental properties possess qualities independently of the observing subject (but see counter arguments in Dennett 1991, pp. 375–83; Lycan 1996, pp. 72–75; Rosenthal 1991; and Tye 1995, p. 100). In assessing this novel ontology, the causal status of qualitative attribution, and the actions thereof, are determined over generations rather than by instances of one physical or chemical reaction and/or transformation. Note also that this new ontology is characterised by qualitative ascription which, in all its modes, need not be a substantive physical or chemical “property” but which is no less physical (again this notion requires detailed consideration, noting Jackson 1982: for relevant discussions on ontological emergence see Kim 1999, 2006; O’Connor and Wong 2005; Campbell and Bickhard, 2011). Inevitably, a key inquiry for researchers and theorists concerns the extent to which the subtleties of this proposed qualitative ontology might be instructed through innately acquired biochemical mechanisms and how it is that such mechanisms might grant sophisticated and subtle qualitative assignation to environmental particulars: what might be the detail and structure of the matrix? I am of the view that biochemical and neurological mechanisms are capable of delineating, notably in a qualitatively relevant manner, any kind of environmental particular, whether it be a particular electromagnetic wavelength, chemical compound, vibration frequency, amplitude, pressure, pH, etc. This is because any given environmental particular has, to some measurable extent, a relevance, and it is the nature of this relevance that qualifies its possible qualitative attribution. Of particular interest to the investigation of this inquiry is the application of optogenics and designer receptors exclusively activated by designer drugs (DREADD) based chemogenetic tools (for examples, see Asahina et al. 2016; Dong et al. 2010; Inagaki et al. 2014; Jacobs et al. 2007; Roth 2016; and Wang et al. 2011). This research is focused on brain function through the manipulation of neuronal and non-neuronal signal transduction in a cell-type-specific fashion. This facilitates the identification of the circuitry and cellular signals that specify behaviours, perceptions, emotions, innate drives, and motor functions in species ranging from flies to non-human primates. However, I anticipate the research being extended to explore Umwelten, and more specifically, to explore the biochemistry and circuitry that instantiates the qualitative characterisation of environmental particulars. In theory, one could surmise that this account of the emergence and evolution of a qualitative ontology is a first-step response to the challenge that Chalmers (1995) coined the “hard problem” (see also Nagel 1974). Of course, regarding the hard problem, Chalmers was referring specifically to the phenomenal qualitative content of conscious experience, to which humans can directly relate from personal experience. He was not suggesting that the biochemical mechanisms of simple organisms were relevant to the problem of qualitative content. Nevertheless, what I have been arguing is that the precedent is there in evolving biochemical and neurological mechanisms for a nuanced qualitative ontology to evolve in increasing sophistication from the most primitive to the most complex of organisms. In summarising Part I, I have introduced the idea that replication facilitates a generational discourse which determines a meaningful lineage–environment correspondence. I argued that this correspondence is accurate and meaningful and therefore qualifies a physiological knowledge category which is distinct from conceptual knowledge. I have further proposed that replication tends to lead to innately acquired biochemical mechanisms that assimilate environmental particulars in a qualitatively relevant way. The qualitative attribution to environmental particulars thereby characterises a unique qualitative ontology. I have suggested that this is relevant to the so-called “hard problem” of phenomenal experience. I will now develop these basic ideas and argue that there is yet another distinct kind of environmental discourse and meaningful correspondence that creates its own unique ontological status. Part I concludes with the notion that innately acquired physiologies have the capability to assimilate the qualitative relevance of environmental particulars, and in doing so, to institute responsive and meaningful actions. Obviously such actions would not be possible if these assimilations were absent from experience due to physical constraints. An example of such a constraint might be that a creature does not have the requisite physiology in the first place. Another obvious constraint might be that an environmental particular may be somehow physically obscured from experience. These limiting physical constraints aside, there are two other physical constraints of special significance that I will now introduce here and then discuss in the next section. Creatures that possess only innate capabilities may well posses a rudimentary neural system. They may also travel about through space, be engaged in temporally delineated activities, or be influenced by circadian rhythm. But as their responses are entirely innate, they have no individuated reference frame to the spatiotemporal, and consequently, possess no uniquely individuated spatiotemporal world-view. It is as if space and time are absent or obscured from experience for them. In essence, such individuals are merely complex automata acting on behalf of or in the interests of their species. They do this by providing the physical means for validating the meaningfulness of their physiology’s environmental correspondence and by providing the replicative means for extending that meaningfulness to the next generation; their responsivity to the environment and its spatiotemporal constraints is a relation only of replicative importance to their lineage. But there is a transitional imperative. As autonomic mechanisms and sensory capabilities evolve in sophistication over generations—which is inevitable because the greater the sophistication, the greater the potential environmental responsivity—there is the increased likelihood that the assimilation of multiple environmental stimulations will generate overly complex innate inclinations and thereby evince conflicting or cyclical motivations. Consequently, the survival precedent is to evolve mechanisms that manage the opportunities and conflicts that might arise from the multiple assimilations of the environment. The remit of this management is to determine their relative importance and to prioritise qualitative assimilations, thereby increasing levels of behavioural sophistication. In other words, the benefit in the management is its potential to evaluate the vast qualitative milieu and, as a consequence, enable more effective motivational inclinations. From a behaviourist perspective, the important distinction between biochemical assimilation and their evaluation and prioritisation is that assimilation alone only facilitates physiological adaptation due to generational discourse while the latter facilitates behavioural adaptation courtesy of a continuous interactive experiential discourse. Both kinds of discourse enable a particular category of meaningful correspondence to evolve. With generational discourse, an organism’s innately acquired physiology, in essence, qualifies the statement, “this complex set of biochemical capabilities is currently best suited to the environment for the survival (continuance) of the replicating lineage”. With experiential discourse, the evaluative process is one that qualifies the statement, “this particular qualitative experience event is the most relevant to the survival of the individual (which, as it happens, is also of relevance to the survival of the lineage)”.5 What we can say of the former is that the meaningful correspondence equates to a physiological knowledge category that is qualitatively relevant to the survival of a replicating lineage (as argued in Part I). Of the latter, we can say that the meaningful correspondence equates to a phenomenal knowledge category where an individual continually evaluates the relevance of its qualitatively delineated spatiotemporal world-view to better inform and motivate sophisticated behaviours. What this describes is the constitution of an embedded subjective world-view: it is a unique ontological status that can only be determined by an individual’s experiential discourse which is justified through its associative accuracy with and relevance to a world of phenomenal qualitative attributions. Earlier, I proposed that replication affords a novel causal status over chemicophysical mechanics, thereby determining a new causal correspondence between the qualitative assimilation of environmental particulars and innately acquired motivations. Here, that qualitative causal status itself is subverted. Innate causal motivations are now subordinate to processes that evaluate their relevance to the experienced moment which qualify motivational inclinations and override innate dispositions. Depending on the complexity of a creature’s neural capabilities, the experienced world is now punctuated, to some extent, by memories and recollections, antecedents and consequences, likes and dislikes, associations and disassociations and the like, all of which constitute part of the individual’s living experienced world. If we recall the earlier quotation taken from Merleau-Ponty (1963) we can appreciate how these considerations account for an entirely distinctive causal relation instituted by what Merleau-Ponty calls the “internal law” of the creature. In this instance, the internal law is not some biochemical mechanism that triggers the rehearsal of innately acquired responses. Rather, the creature, in virtue of its sophisticated neural mechanisms, is situated in its unique and particular qualitatively delineated spatiotemporal world upon which it has cause to make its own individuated behavioural responses. On my account, such creatures are conscious of the changing impression of the qualitative phenomenon of their own particular experiences when their world becomes uniquely spatially, temporally and qualitatively differentiated. Furthermore, I claim that this novel ontological status embraces the “what it is like” to be an individual that is phenomenally conscious (Nagel 1974). Accordingly, phenomenal consciousness is a manifestation of the process of evaluating the qualitative assimilations of the environment through suitably differentiating biochemical and neurological mechanisms. Neural mechanisms have the capability to qualify a multitude of biochemical assimilations to accommodate sensory, affective and operant sensitivities. The expectation is that an organism possessing more than 100,000 neurones (approximately 10 million synapses) is likely to be capable of mediating a constantly changing landscape of evaluated environmental assimilations. In doing so, it experiences environmental interactions as an individuated and qualitatively differentiated phenomenon. While such creatures need not introspect about reality or acknowledge in themselves that they have this experiential understanding, they do live nonetheless as unique beings embedded in a world that is, for them, qualitatively and spatiotemporally delineated. This perspective is characterised in the following passage. I argued in Part II that creatures that have the means of evaluating the qualitative relevance of environmental particulars unfailingly characterise the world in two important respects (to a degree that depends on the level of sophistication of their neural system). Firstly, to some extent, the world is characterised as consisting of objects of varying importance that have a spatial relation to one another and to the individual. In other words, the world is characterised three-dimensionally, with the individual situated centrally within that particular landscape. Second, these objects are characterised as having consistency over time but undergoing change nonetheless: the world is characterised temporally. Consequently, from the perspective of the individual creature itself, the existential experience is of a spatiotemporal world, delineated qualitatively; the creature’s perspective, in essence, is individuated and in some sense subjective. One implication of this spatiotemporal and qualitative prism which defines the constraints through which the world is viewed is that such creatures develop a relation to the world that is rule-bound. What I mean by this is that these creatures relate to the constancy of objects in space, to their motion over time and to the qualitative nature of experiencing them as indubitable facts. Nevertheless, as the quotation from Kant above suggests, these rules are not recognised by the individual as rules about their existing reality. Such creatures have no reason to think “there are rules” about the phenomenon of experience and its spatiotemporal characterisation—living the phenomenon through experiential discourse is the extent of their embedded understanding of the world. Now, it goes without saying that cognitive sophistication varies significantly across the animal kingdom, from invertebrates to humans. And behavioural observation suggests that greater cognitive sophistication probably bears a correspondence with more complex understandings concerning the rule-bound constraints of the objective world and how this world relates to the individual. I propose that a unique level of cognitive capability began to emerge, possibly in early hominid individuals, that led to the abstraction of principles about the rules concerning spatial, temporal and qualitative relations: if rules of association exist, then so must more general principles about those rules exist. To some extent, the use of the mirror mark test is an attempt to qualify the nature of this kind of intellectual sophistication. It is worth noting, however, that on Mitchell’s (2015) account visual-visual matching (present in most mammals and birds) and understanding of mirror correspondence are transitional capabilities necessary for kinaesthetic-visual matching, which, in turn, is necessary for passing the mirror mark test and thereby demonstrating mirror self-recognition. These transitional capabilities indicate that the processes involved in the abstraction of principles about the rules concerning spatiotemporal and qualitative relations are complex and not yet fully elucidated. Nevertheless, what I am proposing is that, for any given individual human, the acquisition of general principles begins to formalise these rules as consistent with the concept of an existent objective reality. For early hominid individuals, acquiring principles about reality supplemented the mere individuated phenomenon of an experienced and lived reality. The acquisition and development of these principles about the world, which are particular to each individual, constituted interpretations of a proto-conceptual rather than of a mere phenomenal nature. Such conceptualisation are not determined by some apparatus of reasoning, nor does it align with an abstract concept or certainty (cf. Cassirer 1985, Theory of the Concept, pp. 162–190), but is instead a network of inferences that fixate its creator to its world in a manner that bears sufficient coherence with its observations. The importance of this development is that the individual is inclined to engage in an enterprise of thoughtful consideration that moderates and reformulates a conceptual interpretation of the rule-bound objective world. This evinces a novel kind of introspective discourse about the nature of the world’s existence in principle, and with it a unique ontological status (cf. Peacocke 1992; Neander 2012, section 4.3 on concepts and their nature). Again we can look to Kant for insights here. How might we understand this transcendental unity as a novel ontology? When an individual begins to acquire the germinal notion of interrelated principles, or proto-concepts, an inescapable circularity emerges: if the formulation of proto-concepts inclines their thinker to conceive that there is a world that exists as a rule-bound factual and objective certainty, then that thinker unavoidably develops concepts concerning their own existential identity, “for how else,” the more introspective individual conceives, “can such conceptions exist without me existing to have those conceptions in the first place?” It is worth nothing, however, that this circularity is not articulated with a inner voice or language of thought but is, initially at least, merely a dawning realization.6 This emerging realisation entices a sense of revelation, for it evinces introspections that compel the individual to identify its own particular subjective self embedded in a phenomenon of qualitative experiences and existing as a bodily entity of exception within an objective spatiotemporal world (cf. Merleau-Ponty’s 1968 extensive introspections). The interacting existential concept states that it exists—“it” being the unique experiencing subject, or Dasein (Heidegger 1962)—in a world thus conceived in accordance with the principles that are necessarily grounded in the rules of an objective spatiotemporal reality. In other words, the objective principles of a physically interacting world (characterised phenomenally) come to encapsulate the rules that qualify the individual’s particular subjective self-identity. This unique self-realisation determines a novel ontological status, having never previously existed: its status identifies its self as a conscious experiencing subject embedded in an objective, qualitative spatiotemporal world. As noted in the introduction, Nagel (1998 and 1986, noting chapter 4) presents engaging insights in this area. He explores the conundrum of how a particular person perceives an objective world from within their world-view and thereby how it might be possible to arrive at an explanation of that subjective viewpoint objectively. He argues that this “is a problem that faces every creature with the impulse and the capacity to transcend its particular point of view and to conceive of the world as a whole” (1986, p. 3). He emphasises that explaining the subjective viewpoint objectively requires the development of a conception of a subjective point of view which is not privileged or individual-specific. In other words, he argues that we need to develop subjective universals or “a view from nowhere” (see Harré 1999 who provides analysis and an alternative response to Nagel’s challenge). The thesis outlined in this paper arguably provides the requisite narrative that illustrates why individuated subjective world-views emerge from an objective but qualitatively experienced world. At any given time, it is experience and an appeal to the rationality of consistency that substantiate an individual’s reasons for believing that its concepts are justified—although the aforementioned circularity famously heightens the mystery of our own particular subjective identity and why it happens to exist in the first place. Inevitably, when communicating, an individual human will not merely express the unmoderated feelings that reflect the immediate impact of experience, as other animals do, but will additionally be compelled to communicate in a manner that articulates conceptual revelations about those experiences and all that those interpretations might imply. In this endeavour, human thought and communication are engaged in a unique kind of introspective discourse where the validity of concepts about the world is considered, expressed and refined, and where ideological stances are subsequently founded and defended within community and cultural settings. My intention with this three-part paper has been to explicate a trichotomous hierarchy. Part I The physiological. Replication is a mechanism that facilitates a generational discourse which determines a meaningful lineage–environment correspondence. The resulting biochemical assimilation of environmental particulars determines a unique “physiological knowledge” category and instantiates a novel qualitative ontology. Part II The phenomenal. Biochemical and neural mechanisms evaluate and prioritise the individual’s qualitatively assimilated environment instantiating a meaningful experiential discourse. The individual creature thereby possesses a qualitatively delineated changing spatiotemporal world-view that qualifies the character of its phenomenal experiences. This capability defines a unique “phenomenal knowledge” category and leads to a novel individuated subjective ontology. Part III The conceptual. Cognitive mechanisms facilitate the development of principles concerning the objective rule-bound world. This generates an introspective inquiry concerning the existential nature of the subject’s self and position in the world. This qualifies a “conceptual knowledge” category and determines the novel ontological status of the existential being. Each category in the hierarchy requires the implementation of a distinctive mechanism of environmental engagement. Increasingly sophisticated forms tend to evolve within the limitations of the interactive mechanisms of each category.7 The increase in sophistication in each category leads, inevitably, to the emergence of the novel mechanism particular to the next category in the hierarchy. In essence, there is an emergent hierarchy of evolving categories delineated by the nature of their mechanism of environmental engagement. Each mechanism of environmental engagement justifies its existence, importantly, where it bears some pertinent meaningful correspondence with the environment. What I have advocated is that each category has a causal relation with the environment through physical interaction, but that their specific kind of mechanism qualifies distinctively the meaningfulness of that interaction and, subsequently, the nature of any response. So the causal chain of physical interaction feeds value-laden constructions that are ontologically distinct in each category, which is why I call it a hierarchical construct theory.8 The nature of the structure of this trichotomous hierarchy provides a response to the challenge presented in Jackson (1982) (see also Nida-Rümelin 2015). Furthermore, there cannot be conceptualised awareness in the absence of phenomenal experience, which in turn is not possible without a physiology of interrelated biochemical mechanisms. Consequently, the thesis has the potential to provide a robust response to Kripke (1972) and Chalmers (1996, pp. 94–96). To say there is a hierarchy implies that it probably extends in both directions to more basal and to higher levels—I have detailed only three levels in this paper, namely, the physiological, phenomenal and conceptual. But by extension, one can surmise that in the downward direction we have the precursor to replicating forms whose ontological distinctions are described by classical physics and, a level further down, by quantum physics. In the opposite upward direction, we can surmise that there is likely to be another category in the hierarchy that is yet to emerge from the human existential world-view. There is good reason to suppose, and it must be an inevitable expectation of the emergentist’s position, that in the future a new category will emerge from the current human state of being that will be as transformative as each preceding ontological transition. This new category will determine an ontologically distinct status and meaningful relation with the world that will transcend that which we humans presently enjoy. Foucault (1972) argues that discursive meaning depends on the prior conditions in which it emerges and exists within the field of discourse. This principle applies equally to the wider interpretation of discourse that I advocate. Here, as elsewhere, environmental particulars might include such things as differing electromagnetic frequencies, auditory frequencies, chemical properties and concentrations, temperature variations, humidity and pH levels, each being potentially relevant to optimal organism function. See Emmeche 2004, pp. 117–118 on qualitative organicism where he talks not of direct and indirect but of “primary” and “secondary” stimulants. It is worth mentioning that the two considerations here, namely the needs of the species and the needs of the individual, may not always align. In other words, they may each present conflicting motivational inclinations. A sophisticated non-human animal might self-identify as “that which experiences reality”, but this does not mean that they will be disposed to have any introspective realizations about that self-identification. See Heylighen’s (2000) appraisal of the approaches to exploring the evolution of levels of complexity. In contrast, Dennett (1987, 2009) argues that there is no hierarchy as such, but a complexity, representational and intentionality greyscale (note also Lycan 1996, pp. 118–121). On Dennett’s account, the importance of the construction of complexity in the evocation of mental content—be it the mental content of a thermostat, a supercomputer or a conscious human—is merely one of degree, which thereby assumes an unqualified correspondence between meaning and function (see Searle 1980, 2010). I want to thank the reviewers and editors for their helpful suggestions. I owe special thanks to Jeanne Ruppert, Dustin Hutchinson and Evette Smott for spending considerable time in critically evaluating the work and posing awkward questions. Neander, K. (2012). Teleological theories of mental content. In E. N. Zalta (Ed. ), The Stanford Encyclopedia of Philosophy. https://plato.stanford.edu/archives/spr2010/entries/content-teleological/. Accessed 28 Nov 2018. Nida-Rümelin, M. (2015). Qualia: The knowledge argument. In E. N. Zalta (Ed. ), The Stanford Encyclopedia of Philosophy. http://plato.stanford.edu/archives/sum2015/entries/qualia-knowledge/. Accessed 28 Nov 2018. O’Connor, T. & Wong, H. Y. (2015). Emergent properties. In E. N. Zalta (Ed. ), The Stanford Encyclopedia of Philosophy. http://plato.stanford.edu/archives/sum2015/entries/properties-emergent/. Accessed 28 Nov 2018.